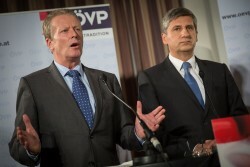 Yesterday evening Reinhold Mitterlehner has been elected by the ÖVP board as new party chairman and vice chancellor. Spindelegger himself had left the party headquarters shortly before. This article includes a total of 378 words.